Making her second appearance on the Clyde this week, the Danish tanker EURO SWAN was caught as she passed Cloch Point on her way towards Finnart on Saturday morning. 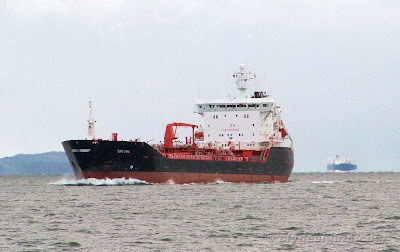 She is currently employed on the Brostrom's service taking regular consignments of fuel to Belfast. Also seen in the distance, several miles down river at the No 6 anchorage off the north end of Cumbare, was the massive crude tanker ASHNA, which had moved downfirth from Finnart to await completion of her discharge when space became available at the Ineos oil terminal.